"Health care is primarily about people-to-people interactions. It is about understanding, diagnosis, physical contact, communication, and, ultimately, providing care. By bringing people together, telecommunication technologies have the potential to improve both the quality of and access to health care in the remotest areas of the developing world. Telemedicine offers solutions for emergency medical assistance, long-distance consultation, administration and logistics, supervision and quality assurance, and education and training for healthcare professionals and providers. This book aims to redress the relative lack of published information on successful telehealth solutions in the developing world. It presents real-life stories from Asia, Africa, and Latin America. It is rich in practical experience and will be of interest to health professionals, development workers, and e-health and telehealth proponents interested in learning about, or contributing to the implementation of, appropriate solutions for 80% of the world’s population." 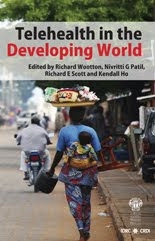 Click on title for full access from the International Development Research Centre (IDRC) . Write an article about nursing diagnosis for a chance to win a $2,000 scholarship to the NANDA International Congress in Madrid, Spain ~ May 12-14,2010! The contest article entry deadline is November 20, 2009. "The student will present his/her winning article in poster format at the Madrid conference, and will be recognized at the conference Awards reception. Following the conference, the winning article will be submitted to the International Journal of Nursing Terminologies and Classifications for possible publication. The winning student will also receive a one-year paid membership in NANDA-I." Topic: Promoting safety and evidence-based nursing care for patients in the clinical setting, by using the NANDA-I (NANDA International) standardized nursing language. Check out this new evidence-based digital resource from JAMA and McGraw Hill. JAMAevidence, designed for medical students, residents, educators, and clinicians, provides the fundamental learning tools required for understanding and applying the medical literature and making clinical diagnoses. JAMAevidence provides full-text access to both the second edition of The User's Guides to the Medical Literature and the newly published The Rational Clinical Examination. On JAMAevidence, these etitles are combined with teaching tools, media, and interactive features to convey the best practices of evidence-based medicine – including the careful assessment and interpretation of medical research. Since the 1970s, the percentage of foreign-trained doctors practising in Canada has declined considerably. A new report released by the Canadian Institute for Health Information (CIHI) shows the number of international medical graduates (IMGs), as a proportion of the physician workforce in Canada, decreased from 33% in the 1970s to 22% in 2007. The decline was seen in all provinces and in the territories and may be largely due to the aging and retirement of the wave of British- and Irish-trained physicians who began practising in earlier decades, as well as smaller proportions of new foreign-trained doctors setting up practice in Canada. The report also found that more than one-quarter (27%) of Canada’s foreign-trained doctors actually grew up in Canada but studied overseas. The latest issue of the NIH MedlinePlus Magazine is now available. In every issue you'll find information you can use to keep you and your family healthy, including links to MedlinePlus, NLM's award-winning consumer health web site. Great for patient education too! "Giving truly great presentations requires skill, work, and practice. Giving catastrophic presentations is far easier. So if you want to take the easy way out and look like a rank amateur, here are 15 surefire tips to guarantee that you leave a really, really bad impression." Can you guess one? ~ spelling mistakes of course tops the list! "Medicine has one of the highest rates of burnout. Experts say some 50% of medical professionals suffer from a form of Post Traumatic Stress Disorder. It's not unexpected - the hours are long, the patients looking to you to solve their problems, and the stakes are very high if you can't. No medical professional wants to compromise patient care, but when they're burned out, it's pretty much inevitable. This week on White Coat, Black Art, burnout among your health professionals [in Canada]. "Dr. Brian Goldman takes listeners through the swinging doors of hospitals and doctors' offices, behind the curtain where the gurney lies. It's a biting, original and provocative show that will demystify the world of medicine. We'll explore the tension between hope and reality: between what patients want, and what doctors can deliver. Doctors, nurses and other healthcare professionals will explain how the system works, and why, with a refreshing and unprecedented level of honesty." UPDATE Jan 12/2010: More research has now been published on the subject of 'burnout' among physicians in the December issue of Canadian Family Physician. A new web resource has been launched called "Evidence-based Tuberculosis Diagnosis" by Stop TB Partnership's New Diagnostic Working Group, in collaboration with WHO, TDR, FIND, GLI, PHAC, and other partners. As new tests and technologies are constantly entering the market and aggressively promoted, decisions about their use must be evidence-based. The aim of this website is to provide the most comprehensive single source of evidence syntheses, policies, guidelines and research agendas on TB diagnosis. It provides access to systematic reviews, reports, monographs and training modules, as well as slide presentations on TB diagnostics. The website is free to utilize, so anyone can view and download the information.